The dress, the flowers, the menu, the venue…you’ll make what seems like hundreds of decisions regarding hundreds of details as you plan the unique wedding that you and your guests will remember for years to come. Considering the impact entertainment will have on the ultimate success of your event, choosing the right wedding DJ should be near the top of your list. We are celebrating over 32 years of business. A milestone for any company, and something to really be proud of within the Minnesota wedding industry. Since day one, we have specialized in weddings. Other parties and events just don’t compare to the celebration of young love. An atmosphere of long time friendship, old stories and ridiculous dances fill the air. Smiles begin to catch like wild fire as your DJ turns up the beat one song at a time. Soon the reason is clear… there is no party like a wedding party. If you haven’t hired a wedding coordinator, most people look to the wedding DJ to assume the role. If the wedding DJ isn’t up to the task, the results could be disastrous. PM Enterprises is staffed by seasoned Entertainers who know how to manage the flow of your wedding reception; bringing a sense of relief that only comes from a Master of Ceremonies. We’re not there to steal the spotlight, but keep the focus on you and your guests. Bad jokes and clown gimmicks are left at the door; and what remains is a helpful professional, ready to lead. This will start weeks prior to the event and follows through until the last person leaves the building. 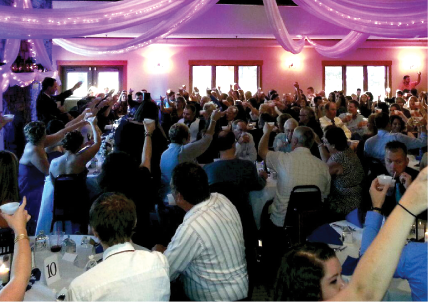 A great Wedding DJ reads the crowd, relates to the guests and communicates with you. The photographer and venue staff are brought together to work as a team, ensuring a stress free celebration. 1. HAVE YOU SEEN THE EQUIPMENT THAT WILL BE AT YOUR WEDDING? 2. DO YOU KNOW WHO YOUR DJ IS? CAN YOU SPEAK TO HIM? 3. DO YOU GET TO PLAN OUT THINGS LIKE MUSIC LISTS? 4. YOU HAVE A BA-ZILLION QUESTIONS, WILL THEY SIT DOWN AND HELP YOU? BEFORE YOU MEET WITH US. 1. DO YOU HAVE A DATE & LOCATION? 2. HOW BIG IS THE GUEST LIST? DO YOUR GUESTS LIKE TO DANCE? 3. DOES YOUR VENUE HAVE ANY UNUSUAL REQUIREMENTS? 4. IS YOUR CEREMONY AT THE SAME LOCATION? You wouldn’t buy a wedding dress without trying it on. So don’t hire a DJ without meeting them. You should know and feel comfortable with who you hire. See with your own eyes if they’re right for you. Here at PM Enterprises, we pride ourselves in transparency. We believe you should see our equipment, hear our sound system and shake hands with a real person. 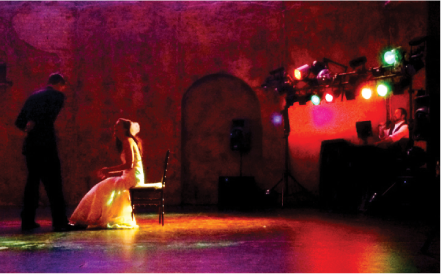 You only get one shot at planning a wedding, and the DJ will make or break your celebration. So avoid those horror story fears and take the time to meet us at our Showroom. Each wedding is different. Different locations, different decor, different people… Each deserving special attention. Visiting our Showroom will give us the opportunity to learn about your wedding details and build a custom package that fits your requirements.